Earth Day, Easter, and Regeneration! We are proud to be a fair-trade company that sources our beans exclusively from heirloom cacao farms owned and operated by regenerative farmer cooperatives on the lush Ecuadorian Pacific coast! As a dedication to our regenerational efforts, this month we are focusing heavily on our planet! The entire month of April will be filled with Earth Day specials in which you will learn more about our farming efforts overseas and all that we do to give back. Our aim is to save the rainforest sip by sip and bite by bite. Plus, we want to give you the opportunity to show us how you give back to our planet through your own “Acts of Kindness”. Additionally, we will be holding multiple events throughout April, that will give you an opportunity to donate through drinking beer, sipping Cholaca, eating Chocolate and more! Finally, at the end of the month, we are celebrating a Cholaca/Chocolate fueled Easter. Stay up to date for special Easter recipes, and new Cholaca products from our Craft Chocolatier partners! We are welcoming spring 2017 with extra kindness! Here at Cholaca, we feel honored by the invitation that regenerative communities have extended us to partner in bringing our superb cacao to the world with the ethical integrity it deserves. We are guided by the skilled team at Terra Genesis International (TGI) and are proud to be a responsible and sustainable focused business. Now it’s your turn! In celebration of Earth Day on April 22nd, we want to see how you can give back to our planet through acts of kindness. Let’s do something delicious together to change the world for Earth Day! A fast-growing number of local craft breweries and chocolatiers have recently switched to our regeneratively farmed Cholaca. Two of them, Copper Kettle Brewing Company and Nova Chocolate, are releasing products to celebrate Earth Day, and a portion of the proceeds will go to regenerative cacao farmers through Yellow Seed, a conscious trade nonprofit. 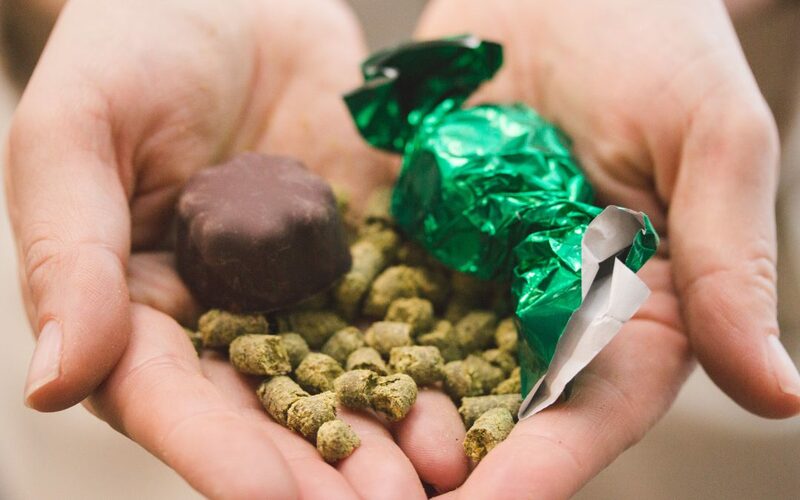 Purchase the Nova Chocolate Hops Truffles all month long here and the proceeds made through April will all go to Yellow Seed! Plus, the 6-year anniversary of Copper Kettle falls on Earth Day weekend. As part of their commitment to supporting a healthy planet, 50% of all Mexican Chocolate Stout sales on Earth Day (4/22) will also be donated to Yellow Seed. Additionally, they will be offering their Mexican Chocolate Stout on special for Cinco de Mayo (5/5), again with 50% of the proceeds of the stout being donated to Yellow Seed. Go to copperkettledenver.com for more info. Come have a Mexican Chocolate Stout with us and Copper Kettle Brewing Company’s Jeremy Gobian in their tasting room! 50% of sales of the stout donated to Yellow Seed. No RSVP necessary! Join us for this special beer release party with live music, Cholaca sampling and Cholaca pancakes with maple syrup! Cultivate connection, awareness and groundedness with your partner to celebrate Earth Day. In a safe and loving space, we will use these supportive practices to learn how to find a common foundation with your partner and stay grounded while moving through the normal cycles of connection and disconnection with ease. The workshop will include partner yoga, Thai massage, communication exercises and a short film clip from Global Glue Project. **This all-levels workshop is for any relationship, regardless of age, gender or how you define your relationship. No previous yoga/Thai massage experience is necessary to enjoy this workshop. There is no better way to celebrate Easter Sunday, than with Chocolate! Stay tuned via social media for tons of delicious Cholaca Recipes to make with your family this Easter! Plus, we are excited to inform that some of our Craft Chocolatier partners will be promoting their new Cholaca Chocolate products this month available for purchase. All the way from Spokane, Washington, we want to welcome Tom Sawyer County Coffee Company to the Cholaca Family! If you’re in the area, be sure to stop in this month and get yourself one of their many delicious Cholaca drinks all available now! Why did Tom Sawyer Choose Cholaca? When we first got Cholaca, we weren’t expecting what we received: Chocoately, rich, healthy goodness. What we were prepared for was your typical dark chocolate and what we got was on a whole other level. Cholaca is an easy product to sell at Tom Sawyer because it tastes good and it’s even better for you. Our customers love knowing they are fueling their body with a healthy chocolate that is still delicious. Some of our most popular drinks are Cholaca chai, spiced Cholaca and at the moment a raspberry Cholaca. What we have in the works is a Cholaca, peanut butter, banana smoothie that will be perfect for the customer on the go looking for a healthy treat. Thanks Cholaca for being awesome and changing the way people experience chocolate! We are super excited to announce that Atlas Demos will be taking over all of our in-store demos where you can sample Cholaca for free, and find out more about why our pure liquid cacao is so amazing! Be sure to follow us on Facebook to find out the upcoming demo schedule for the month at our various grocery partner locations.